Dieser Artikel ist Teil des Reihenwerks "Cytohistology of Small Tissue Samples"
Each volume in this richly illustrated series, published in association with the Papanicolaou Society of Cytopathology, provides an organ-based approach to the cytological and histological diagnosis of small tissue samples. Benign, pre-malignant and malignant entities are presented in a well-organized and standardized format with high-resolution color photomicrographs, tables, tabulated specific morphologic criteria and appropriate ancillary testing algorithms. Vignettes allow the reader to assimilate the diagnostic principles in a case-based format. 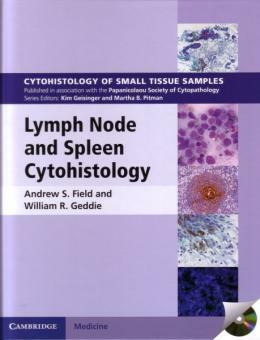 This volume combines a practical approach to performing and interpreting fine-needle biopsy cytology of lymph nodes and spleen, with reports of biopsies and the selection of appropriate ancillary testing required for these challenging small specimens. Each chapter contains a detailed summary of differential diagnostic features, supported by numerous high-quality images and case studies. With over 500 printed photomicrographs and a CD-ROM offering all images in a downloadable format, this is an important resource for practicing pathologists and residents in pathology.